What exactly is “The Lobster Dance”? The Lobster Dance is, in two words, linguistic miscommunication. When we hear another language that we don’t understand, our minds graph that language’s words onto familiar ones. I’ve heard all sort of bizarre mnemonics for second-language learners over the course of my work. Some of the more “what the hell?” ones include the following. Personally, I’ve found these a little annoying because the Japanese-for-Americans ones make no sense and the English-for-Japanese-people ones simply encourage bad pronunciation, but neither linguistics nor second-language acquisition were my major…. Still, we can’t help but hear strange things when we listen. Which brings me to my story. We’ve established that I am a ‘Zuka fan, and as such, I am also a fan of Takarazuka’s most famous show: Elisabeth. Elisabeth, a musical based on the life of Empress Elisabeth of Austro-Hungary, is an originally German-language production that has been a huge hit all across Europe and in Japan and is performed in German, Hungarian, Dutch, and Japanese (not a direct translation) (both Takarazuka and male-female casts). Currently, there is no English-language production. Elisabeth is, in many aspects, like the musical Evita. It’s a dramatic story about a woman’s rise to power as (essentially) the wife of a political figure and her struggles to find meaning and happiness in her life. Evita is narrated by Che Guevara; Elisabeth is narrated by Elisabeth’s assassin, Luigi Lucheni. Oh, yeah, and Death. 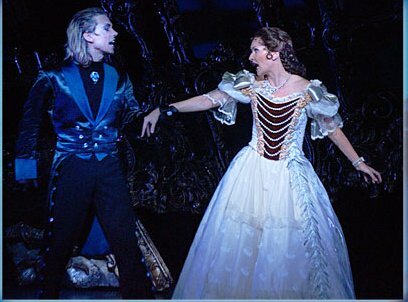 Mate Kamaras as der Tod and Maya Havoort as Elisabeth. Bonus points if you get the reference to this blog. THE LOBSTER DANCE! THE LOBSTER DANCE! Yeah. Cultural linguistic sensitivity fail there. Even now I just can’t unhear it. When I created this blog, I wanted to write about cultural misunderstandings and adaptions in a new way. Not in the “Hey, ain’t Japan WACKY?” way that’s become so infuriatingly popular. Not as an American cultural imperialist, stomping about town extolling the virtues of forks and knives and Western toilets in very loud English; not as a the kind of Japanophile so in love with my new residence as to be so blinded by the cherry blossoms under the moonlight and by the glitter and feathers of a Takarazuka revue number that I forget about the social problems of contemporary Japan. I don’t think this way of thinking is revolutionary. It’s more 改革 (innovation) than 革命 (revolution). I don’t want to sit you down and have a chat about Japan’s long history and explain Japanese syllabary, I want to get to the meat of some of the contemporary culture issues, mainly expressed via media. And, apparently, the best way to write a “State of the Blog” address was by discussing my undying love for Elisabeth. But that’s how I’ve approached multiculturalism in Japan and in the US. It’s the “you like food?” technique. You like food? I like food. Let me give you some of my country’s food and tell you a story about my home country. You like pictures and Japanese media? Me too! Let’s explore social issues with cute boys in aprons and samurai cats! My favorite books in grad school were the ones that weren’t straight-up theory, but about experiences, travel, and media, and how those things hold up a two-way mirror to our culture. So, I hope that in this blog, this semi-city-girl sent out to live in the 田舎 can engage your interest in topics from environmental issues to gender socialization–with a little spider-killing and bean-boiling on the side. *It may help to point out that the Japanese words for country names are katakanaized version of the names of the countries–at least non-Asian ones–in their own languages. Germany is Deutsch is ドイツ (doitsu). **I like to read this not as der Tod actually being there physically but as a symbol of his manipulating other players in Elisabeth’s life. Wow. It’s all coming back to me now. I’ve been wondering for a long time why this blog was called the Lobster Dance, and now that you’ve explained it (again) I suddenly remember you discussing your discovery of this song and your soramimi-esque experience with it. On a separate note, as bizarre as the Japanese katakana versions of a great many things are, I find it an interesting twist how sometimes they are indeed closer to the actual placename (as used by people who live there) than the English name. 韓国（カンコク） sounds more like Hanguk and 朝鮮 more like Joseon, than “Korea”, wherever that came from. Yeah, I really like the Japanese names for places. 台湾 and 香港, too, though those are the same-ish in English. I love telling the older students I have about the Latin names of places in English (“A long time ago, Germany was called Germania in Latin…”). I find those five years of Latin being practical to my job quite a bit! Also, I had no idea what a クロワッサン was the first time I heard it. French-origin words: equally confusing in English and Japanese. I actually have the opposite experience of “Japanese pronounce place names more like that place’s locals” with my own name. Others have noted that their students will “stop reading” halfway through a word. Like, they’ll get as far as the first two syllables and just pick whatever word comes to mind. I have names that are both uncommon in the US, uncommon with foreigners in Japan, and indistinct from each other (to the Japanese). A lot of times I get referred to as “Lastname-Firstname-sensei” by the younger kids. I think メキシコ might be based on the English Mexico, but why did that one escape the “let’s pronounce it their way” post-war trend? Very strange. I didn’t know you liked takurazuka! I’d love to see a production sometime, keep me updated?